My fellow Americans, our long national nightmare is over. 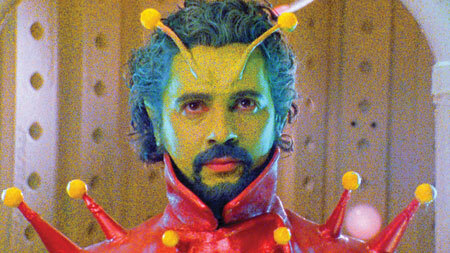 The Flaming Lips have completed Christmas On Mars, the sci-fi film that, since 2001, has spawned endless music-blog updates and disturbing photos of Wayne Coyne in alien-green face paint. More endearing as a concept than a DVD—don’t rule out the possibility of a Lips live event to enhance the film’s surround-sound appeal—Christmas On Mars aspires to be 2001: A Space Odyssey with a Plan 9 From Outer Space budget. The biggest problem with Christmas On Mars isn’t the production (Coyne’s home-built sets are impressive in grainy black-and-white), the plot (which concerns a failing space station, a Christmas baby and a Martian Santa Claus) or the torturously slow pacing. It’s that the film is neither silly enough to be a cult classic nor weird enough to warrant a bong-hit rating. When it comes to the Flaming Lips, creative detours, distractions and folly are all part of the band’s creative process. But in terms of artistic merit, Christmas On Mars weighs a spoonful, not a ton.